The Saiyan prince's giant forehead gets even bigger in Dragon Ball: Raging Blast, as Namco Bandai announces Super Saiyan 3 Vegeta as an exclusive character for the next Xbox 360 and PlayStation 3 fighting game. Earlier this year, Namco Bandai revealed the first game-exclusive character for Raging Blast, Super Saiyan 3 Broly, and the Super Saiyan 3 party isn't stopping there. 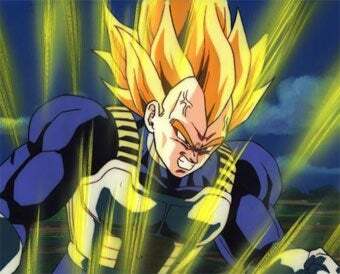 Mortal enemy turned trusted ally Vegeta never achieved Super Saiyan 3 form in the manga, movies, anime, or previous video games, having skipped directly to Super Saiyan 4 in Dragon Ball GT. SS3 Vegeta makes his first appearance ever in Dragon Ball: Raging Blast, meeting arch-rival Goku super Saiyan 3 Goku on even terms for the first time. If you aren't a Dragon Ball fan, this probably makes no sense at all to you, so I will put it in simple terms you can understand: his hair will be larger and more blond. Dragon Ball: Raging Blast for the Xbox 360 and PlayStation 3 drops on November 10th.